As Curiosity beamed its first high-resolution photographs of its martian home back to Earth, those following the mission got a glimpse into another world and saw their own. "You would really be forgiven for thinking that NASA was trying to pull a fast one on you, and we actually put a rover out in the Mojave Desert and took a picture," said John Grotzinger, Project Scientist for the Mars Science Laboratory Mission, during a press conference, "Others agreed. "Hey, is that Mars or the Mojave in NASA rover's photo?" asked a headline at the Christian Science Monitor. 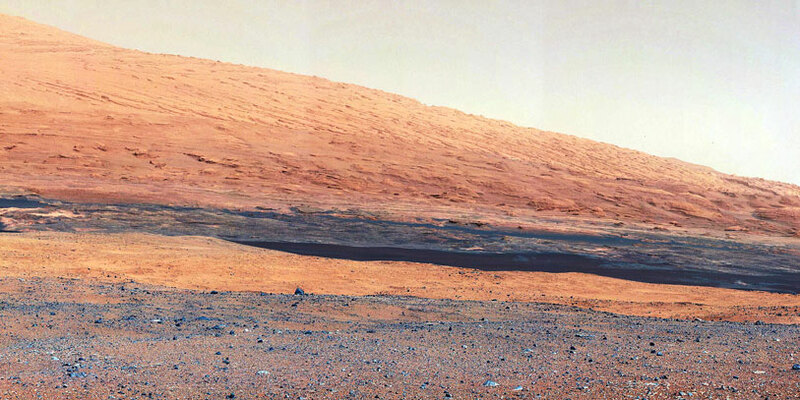 "Curiosity's photos of Mars look like Earth," proclaimed the Detroit Free Press. It's easy to understand the case of mistaken identity: the rock-strewn, windswept landscape certainly does resemble the more barren portions of the American southwest. The pictures tell one story, but the weather station data aboard the Mars Science Laboratory leaves a very different impression. Gale Crater may look like the dusty, basaltic basins of the American southwest, but one look at the thermometer will send you running for the winter coat. Over the first 30 sols, air temperature has ranged from approximately -103 degrees Fahrenheit (-75 Celsius) at night to roughly 32 degrees Fahrenheit (0 Celsius) in the afternoon. Two factors conspire to cause such a wide daily range (most day-night fluctuations on Earth are about 10 to 30 degrees Fahrenheit). The martian atmosphere is very thin; with fewer molecules in the air to heat up and cool down, there's more solar power to go around during the day, and less atmospheric warmth at night, so the magnitude of temperature shifts is amplified. There is also very little water vapor; water is particularly good at retaining its heat, and the dryness makes the temperature swings even more pronounced. The latter aspect is familiar to any novice desert camper who's neglected to pack a jacket and ends up shivering next to the campfire and tearing open hand-warmer packets like it's Christmas morning. Hypothetically, of course. "Deserts on Earth have very extreme temperature ranges," says Mars Science Laboratory Deputy Project Scientist, Ashwin Vasavada. "So if you take a desert on Earth and put it in a very thin atmosphere 50% farther from the Sun, you'd have something like what we're seeing at Gale Crater." The afternoon thermometer readings have gotten the water-seekers excited. With atmospheric pressure just above water's thermodynamic triple point, and temperatures occasionally hovering around the freezing point, it is likely that local niches are seeing above-zero temperatures, and Vasavada acknowledges, "liquid water could exist here over a tiny range of conditions." But don't expect a Culligan water plant in Gale Crater any time soon. "We wouldn't expect for Curiosity to see liquid water, because it would evaporate or re-freeze too quickly," explains Vasavada. "With so little water vapor in the atmosphere, any liquid water molecules on the surface would quickly turn to gas." Even just a few degrees above 32 degrees Fahrenheit (0 Celsius), liquid water would evaporate like a steaming cup of coffee on Earth, until it quickly freezes from rapidly absorbing the latent heat energy that liberated the vapor in the first place. Perhaps Gale Crater isn't so Earth-like after all.